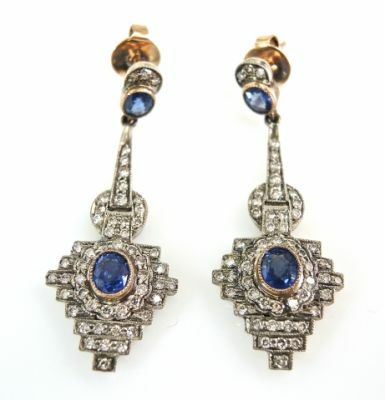 A beautiful pair of Art Deco style18kt rose gold, with sterling silver top, earrings and featuring 4 oval facetted cut deep intense blue sapphires, est. 1.83ct. and 104 round brilliant cut diamonds, est. 1.18ct (clarity: VS-SI & K-L-M colour). They have an architextual design with influence of an Egyptian pyramid.